Heat your wok or big frying pan until it is very hot, add one tablespoon of the oil and add the turkey chunks once the oil is piping hot. Stir-fry over a very high heat for about 8 minutes until golden brown. Transfer the turkey to a colander or sieve and let it drain. Reheat your wok and add remaining oil before you add the shallots and garlic. Stir-fry for 3 minutes until golden brown. Return the turkey to the wok and add the chillies, dark soy and fish sauce and sugar. Stir-fry over a very high heat for another 8 minutes or until the turkey is cooked through. 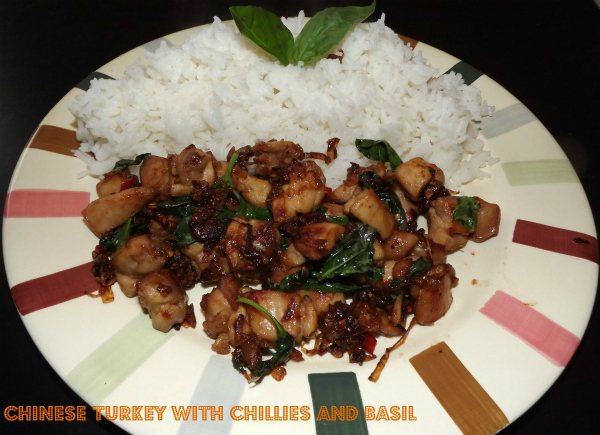 Stir in the basil and serve with some boiled rice. 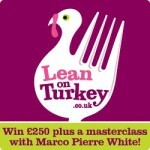 I am posting this recipe as part of the Britmums Lean On Turkey Competition. Feeling hungry after seeing the photo, this seems like a very good recipe to try since the ingredients are easy to find and the methods are easy to follow.